One of the original All Star basketball shoes. What is the oldest, most popular, and all time best selling basketball shoe of all time? (As a matter of fact, 60% of all Americans own or have owned at least one pair of these sneakers!) It is not the expensive Air Jordans that the Nike Corporation produces! Nor is it made by Fila, Reebok, New Balance, or adidas. It is the Converse All Star “Chuck Taylor”! It was in 1908 that the Converse Rubber Corporation opened for business. At first the company only made galoshes and other work related rubber shoes on a seasonal basis. But eventually the company decided it was more efficient to keep their work force employed year round, and began making athletic shoes. With the popularity of basketball, the Converse Corporation saw the need to develop a shoe that people could wear while playing basketball. After lots of research and development, the very first version of the All Star basketball shoe was produced in 1917. The All Star shoe originally came in natural brown colors with black trim. In the 1920s, Converse All Stars were made in all black canvas or leather versions. 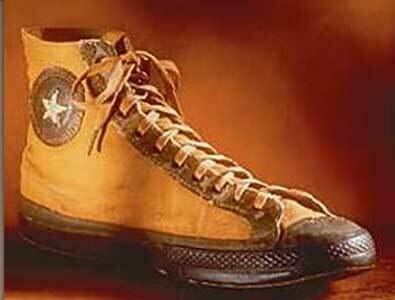 The All Star was to be the first mass produced basketball shoe in North America. It consisted of a very thick rubber sole, and a ankle covering canvas (or sometimes leather) upper. At first sales were slow. They would rapidly increase a few years later, thanks to Charles ‘Chuck’ H. Taylor. Chuck Taylor is smiling every time someone laces up a pair of his “Chuck Taylor” sneakers. Charles H. Taylor was a basketball player for the Akron Firestones. He liked what he saw in the All Star shoe and saw its potential for the sport of basketball As a matter of fact, he believed in the shoe so much that in 1921 he joined the Converse sales force, and later became the player/coach for the Converse All-Stars, the company's industrial league basketball. team. Throughout his career with Converse, Taylor traveled all across the United States hosting basketball clinics and promoting the All Star shoe. His personal salesmanship plus clever marketing devices like the Converse Basketball Yearbooks put his imprint on the sport at all team levels. But the Converse Corporation also bestowed something else on him. 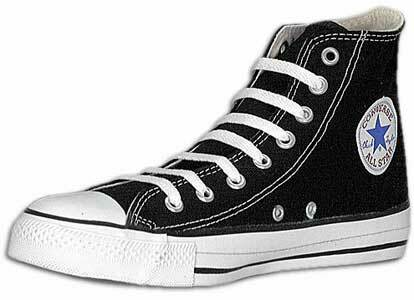 Because he was so successful in promoting Converse All Stars, as well as making important changes in the design of the All Star shoe, in 1932, his name “Chuck Taylor” was added to the ankle patch. The “Chuck Taylor” All Star basketball shoe was born! The first white model was introduced at the 1936 Olympics, a predecessor to today's optical white high top. Soon basketball teams as well as American boys were wearing Converse “Chuck Taylor” All Stars. In the 1930s Chuck Taylor designed the white high top model for the 1936 Olympics, and the shoe with its patriotic red and blue trim became very popular along with all black canvas and leather models of the All Star. Today you can still buy either the bright optical white model or an off-white un-dyed model called unbleached or natural white. During World War II, Chuck Taylor served as a captain in the Air Force and coached regional basketball teams, considered an important morale booster for the troops. And the All Star “Chuck Taylor” went off to war as GI’s did their exercises in the white high top chucks that became the official sneaker of the United States Armed Forces. After World War II, the classic black and white Chuck Taylor All Star High Top was introduced in 1949, a much more eye-catching shoe than the monochrome black models that had been produced up to that time. Basketball was now a major professional sport, with the merger of the National Basketball League and the Basketball Association of America becoming the National Basketball Association (NBA). Chuck Taylor All Stars were the shoe for professional, college, high school, and all serious players, and these distinctive black or white high tops were part of the look of each team. In 1957 the low cut All Star was introduced and became popular as a more casual alternative to the high top. By this time Converse had an 80% share of the entire sneaker industry. 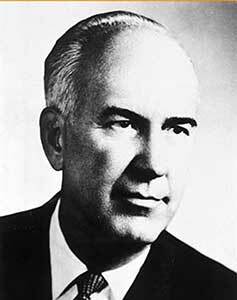 Because of his tireless efforts promoting the sport, Taylor was called the “Ambassador to Basketball” and in 1968, Charles H. ‘Chuck’ Taylor was inducted into the Basketball Hall of Fame. Unfortunately, one year later he passed away. The classic black and white high top was introduced in 1949. Along with the passing of Chuck Taylor went the dominance of the Converse Company. New rival companies stepped in, spearheaded by the Nike Corporation, and began to chip away at the market share and influence of Converse. Lots of changes began to occur in the athletic shoe industry. These rival companies introduced new models with new colored looks, all leather uppers, and high tech innovations like pumps and air cells. Although Converse responded by introducing chucks in a variety of colors, and new models like the One Star and Dr. J, teams began abandoning their All Stars and going with other models and brands. Starting in the 1970s, athletic shoes became so popular as footwear that adults refused to give up wearing them. Everyone wanted the look and feel of sneakers on their feet. Many new athletic shoe companies emerged and marketed a wide variety of basketball and other sports and leisure shoes. The Converse “Chuck Taylor” All Star, once the premiere shoe of elite basketball players now became the shoe of the counter-culture and of baby boomers who refused to stop wearing their favorite pairs of chucks. The shoes became very popular with rock musicians, and younger generations wore them for their distinctive looks, colors, and comfort and as an alternative to the high priced high performance shoes made by Nike and other companies. They were considered a leisure shoe and now were purchased because they were fashionable. Converse responded by manufacturing chucks in hundreds of different variations that included prints, patterns, unusual colors, and special models for different age groups. In the 1980s and 1990s, the Converse Company began to experience hard times. The ownership and management of the Converse Company changed several times. These changes and bad business decisions along with their loss of market share took its toll on the company, and in 2001 they filed for bankruptcy. But the brand was too well established to abandon, and new ownership took over, closing all North American manufacturing and moving the manufacture of Converse athletic shoes from the USA to Asia. The brand was reestablished successfully and the company was eventually purchased by its rival, Nike. Despite all of the innovations and changes in the athletic shoe industry, ‘Chuck’ Taylor athletic shoes continue to live on! Thousands of pairs of high top and low cut chucks are still sold each week worldwide. Because they are a unisex design, the same sneakers are worn by both men and women, girls and boys. As of today more than 800,000,000 pairs of chucks have been sold. Unlike other sneakers that lose their popularity, the Converse All Star ‘Chuck’ Taylor still remains fashionable and people who like chucks are fanatical in their devotion to the shoes. As the decades pass, these simple but timeless sneakers are rediscovered and adapted by millions of people in each new generation who like their look and feel on their feet. Converse All Star ‘Chuck’ Taylors are over 80 years old but still going strong! 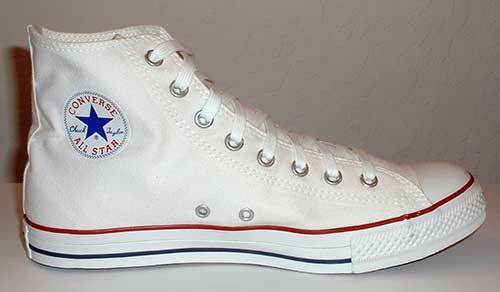 And since 1949, the basic design of the ‘Chuck’ Taylor basketball shoe has not changed. Converse All Star Chuck Taylor basketball shoes in their distinctive high top and low cut oxford models are the classic American sneaker, and a favorite shoe for people of every age all around the world. For great resources about the life of Charles ‘Chuck’ Taylor or the history and impact of Chuck Taylor basketball shoes, click on the Books link below. The newly revised edition of Chucks! The Phenomenon of Converse Chuck Taylor All Stars is now available. Planning to write a research or term paper about chucks? Check out How To Write A Term Paper About Chucks in our articles section. See our gift ideas for that chucks person on your list.